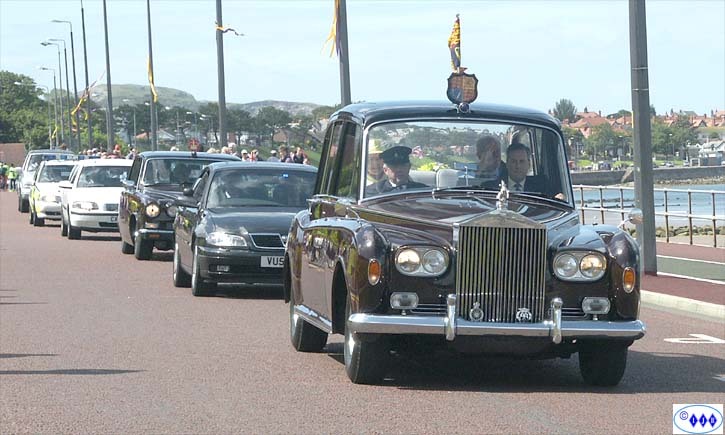 Colwyn Bay promenade was closed off today to allow for the visit by Her Majesty, The Queen. Security was tight and ever present but there was a remarkable degree of openness about the whole affair which was clearly enjoyed by the many people watching. Whoever was responsible - well done from us all. 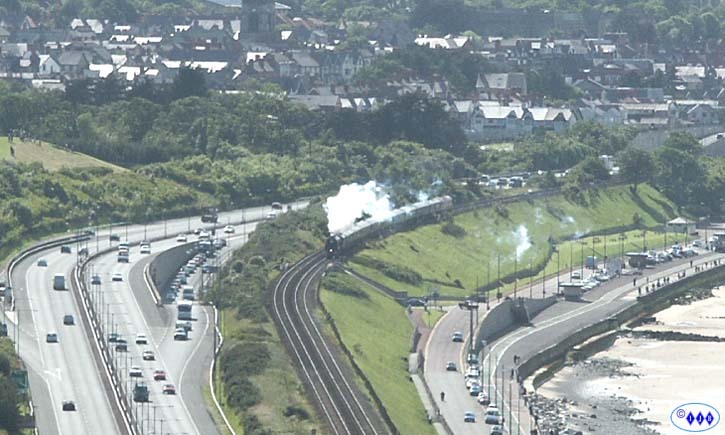 With hindsight it would have been better to have been on one of the A55 overbridges to photograph the train but, as it was, I chose to see this historic event from Penmaenhead and the gale force winds it was experiencing! 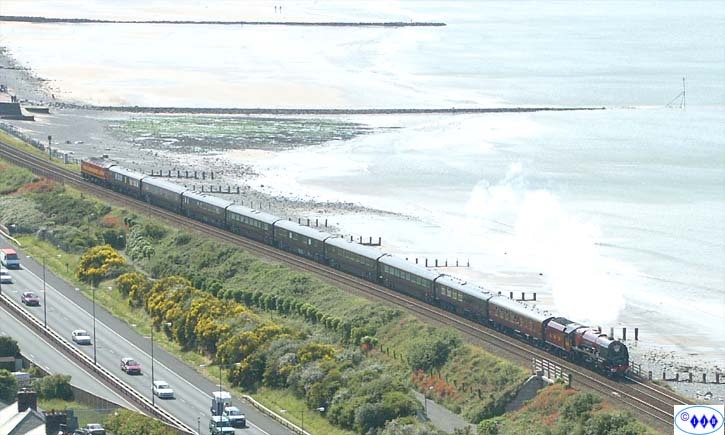 After one false start, when a 175 ran ahead of the Royal Train, the Police helicopter appeared over the track and a plume of steam from the vicinity of the station, announced the arrival of the Duchess of Sutherland. Earlier the helicopter had buzzed the headland to assess the dozens of photographers and spectators present. Here the train has just come in to view. 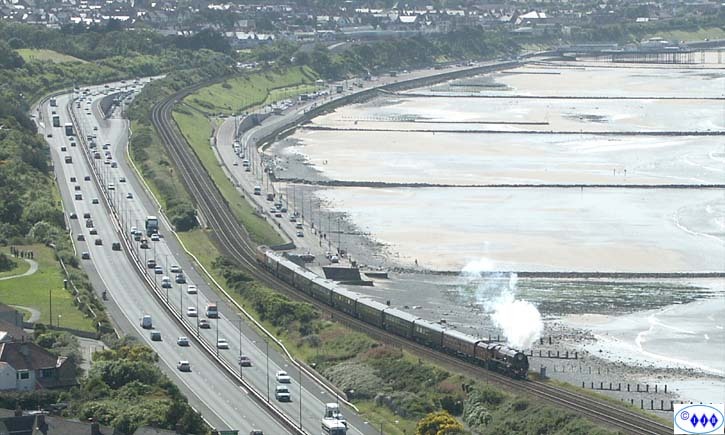 Closer now and to a long and mournful sounding of the classic Stanier hooter the train approached the A55 overbridge. The locomotive was working hard and the last time I heard that rapid, 8 beats to the rev, was way back in the 60's on the West Coast Main Line. By now the hair on the back of my neck was standing up! Crossing the A55 Expressway. 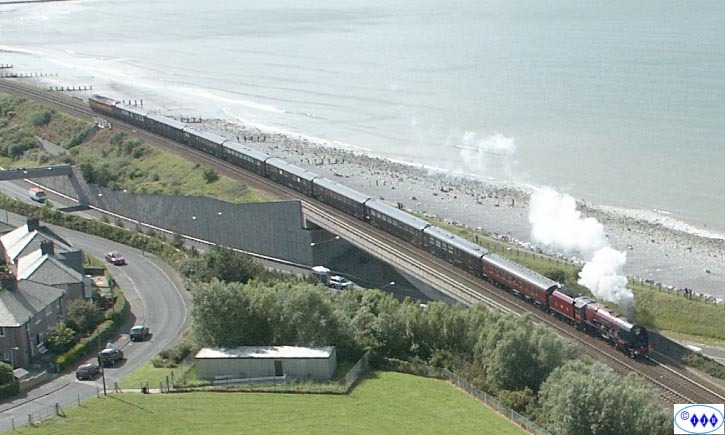 What other locomotive preserved today could have pulled nine bogies AND Windsor Castle along the North Wales Coast? I think a donation to The Princess Royal Class locomotive Trust is in order, don't you?